I’ve recently been studying up more on fermentation. I am learning all about the benefits of fermented foods in my diet. I’ve made kimchi in the past, and enjoyed it, but I didn’t really realize how good it is for you! I started to delve more in to fermentation when I ended up with excess vegetables in my CSA. I didn’t want to risk wasting vegetables that I may not use, so I looked for ways to prolong their life. I considered canning my vegetables, but I don’t have the patience to deal with the whole jar sterilization and cooking process. Maybe one day. 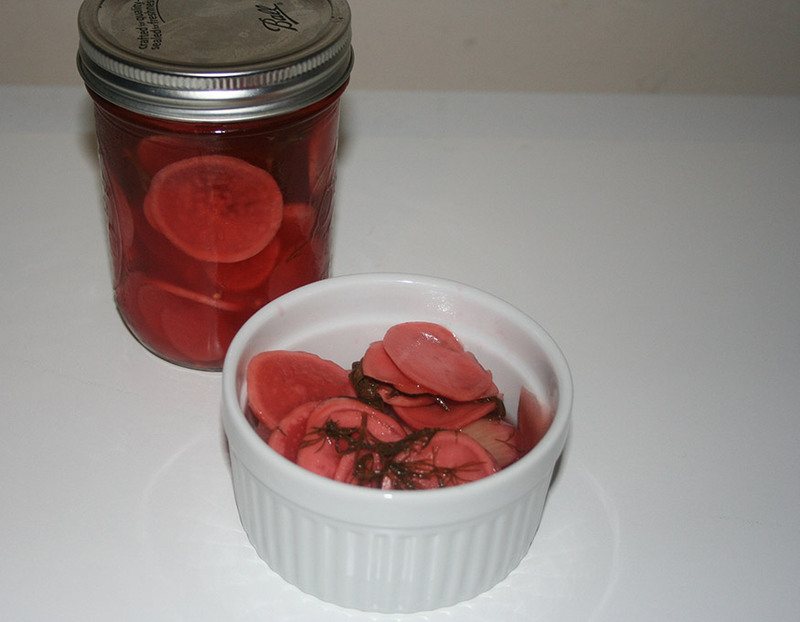 I learned that fermentation can be very easy, and doesn’t require as many tools as canning. It’s also far less precise than the canning process. I then learned about the health benefits . Fermented foods are said to aid in digestion, creating a natural probiotic that helps balance your gut. As food ferments, the foods becomes enriched with good enzymes and vitamins. I kept reading, and as I did, I knew I had to give it a try. 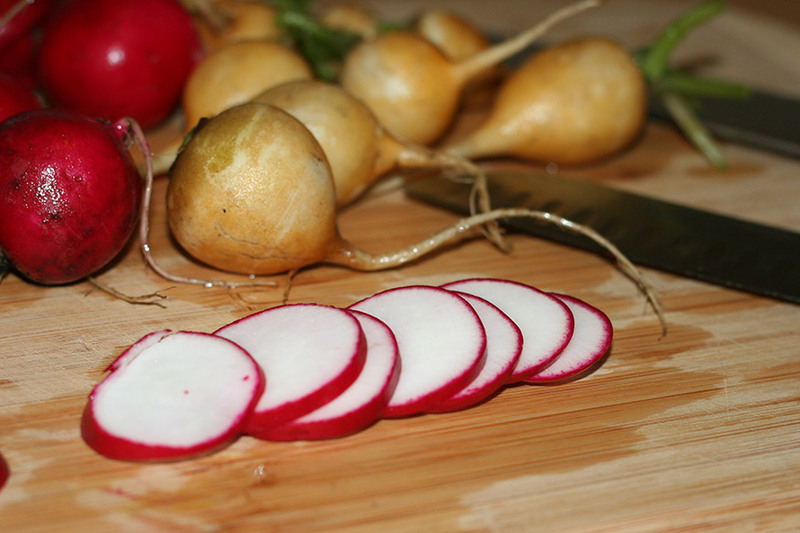 I began my summer ferments with some radishes. I had a large amount of beautiful organic radishes from my co-op share and I knew that they wouldn’t all get eaten in salads. I decided that I’d ferment them using a simple 2% brine base. I began by cleaning and trimming these beautiful radishes. Then, I sliced them thinly. 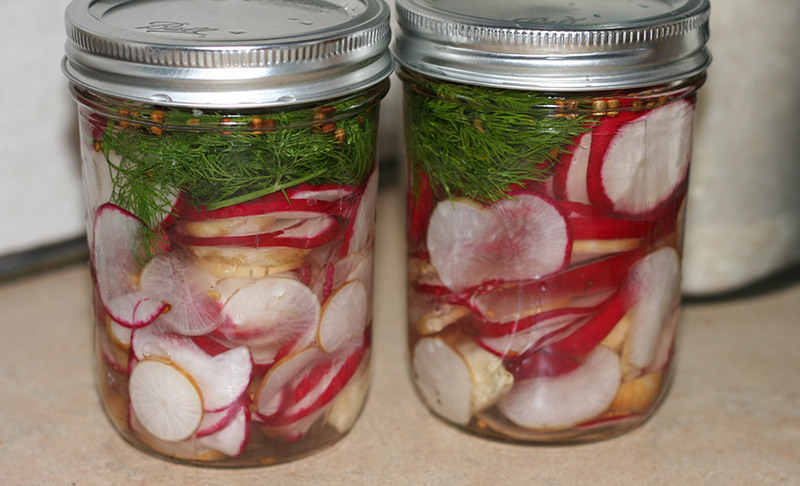 I washed my jars well and packed the jars with garlic, dill, my sliced radishes and some peppercorns. I then added some of the liquid brine and sealed the Bell jars and set them aside in a warm, dark corner. 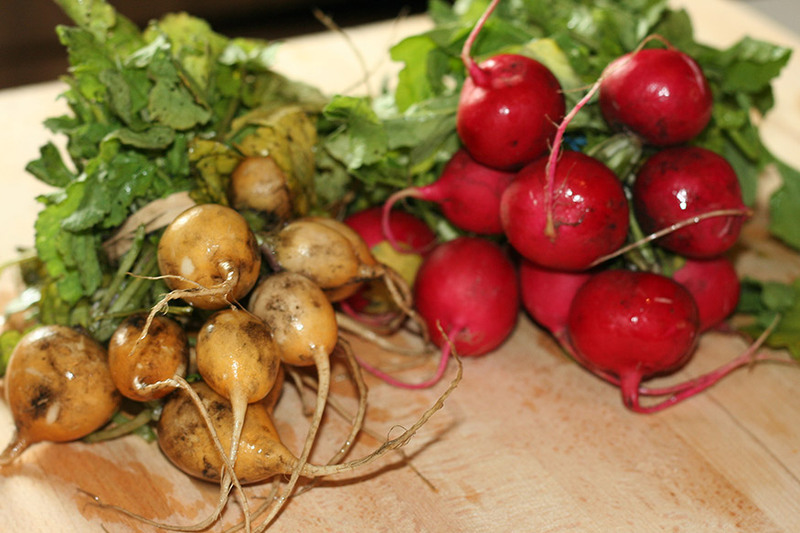 I checked on them every few days to see how they tasted and to make sure that the radishes were still under the liquid brine, pressing them down if they began to pop out. 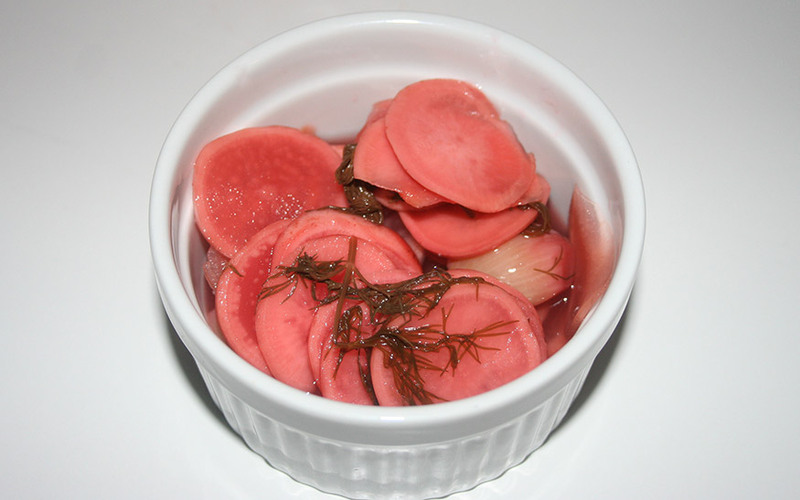 I kept them in my dark corner of the counter for 2 weeks, at which time, I determined by tasting them, that the radishes were ready and then placed them in my fridge. They were done and ready to be used. I highly recommend this simple ferment if you are a beginner at fermenting.